Tooling and Moulding Maintenance Software is a requirement for most companies with toolmaking machinery and plastic injection moulding equipment. Some do actually offer a tooling control option but note that this can often be configured within a standard PM scheduler. 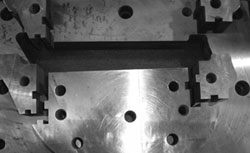 Tooling Maintenance Management Systems and other packages designed specifically for this will come configured with the terminology used in tooling and moulding. However, essentially this kind of maintenance is not much different from any other equipment maintenance. If specific fields related to this are required then there is often a "user defined fields" option in these packages that lets you set these up for just such circumstances.